Since their formation in 2016, Castleford Tigers Women have become a force to be reckoned with in the world of women’s rugby league. Despite reaching the Challenge Cup final and a Women’s Super League semi-final last year, many in the team felt disappointed about the fact that they ended the 2018 campaign without major silverware in the trophy cabinet. Six-months on since their 24-10 semi-final loss to Leeds, the Tigresses are now gearing up for the start of the new season. Their aim for 2019 is simple and is the same as the men – win a major title. During the winter period, Castleford have significantly strengthened. The arrival of Rhiannion Marshall from Leeds Rhinos and Claire Garner from Bradford Bulls will no doubt add a lot of experience and maturity to the Tigers game. The two players have made a tremendous impact in pre-season with Garner being named the captain and Marshall the vice-captain only a few short months after joining the club. That decision was taken by the squad itself who all voted for who they wanted to lead the team. Both Garner and Marshall expressed their surprise when speaking at the club’s shirt presentation night. Garner said: “I’m very proud to have been names as captain – I certainly didn’t expect it. First game for the Tigresses is an away clash with York on Sunday, April 7. The Tigers then face a tough three-week period with Wigan, St. Helens and Leeds Rhinos all to come at once. However, in-between those games the team does have another fixture planned. In a historic move, the Tigresses will join the men’s side in Perpignan and take on the Catalans Dragons in a highly anticipated double header. The game against Déesses Catalanes is expected to become an annual one as the two clubs continue to build strong ties. There is certainly a lot happening with the women’s team this year. 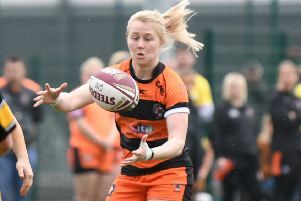 A lot of that is down to the work of the backroom staff who in three short years have turned an idea of a Castleford team for women into a flourishing reality.